a subsidiary of Quest Consulting Group Inc.
Creme du Ciel products, with the world-patented active ingredient Charismon (R), have been known in Europe for years to heal severe burns in a fraction of the normal time, without the danger of infection and the severe discomfort of pain. 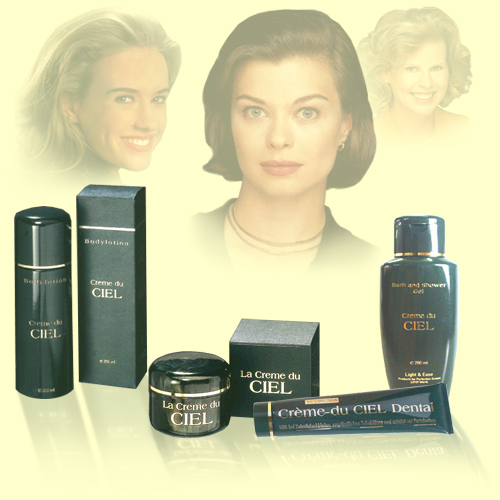 The Creme du Ciel Cream has also shown tremendous and surprising results treating herpes blisters and cold sores and outbreaks, often times preventing them at their outbreak, alleviating the pain and scars from severe sunburns, preventing scars from cuts, bruises, operations, accidents, and insect bites, making piercings on the body, the face, and inside the mouth a jif, eliminating infections and pain, if applied properly, healing psoriasis and other chronic skin illneses, visibly reducint or eliminating wrinkles and age spots, in short . . . a miracle for all kinds of skin ailments. The Creme du Ciel Toothpaste is known to treat gingivitis, eliminate bad breath, heal bleeding gums, restore gum to cover bare tooth necks, reduce and quickly heal cold sores and herpes blisters, treat piercing in and on the mouth to prevent pain, infections, and discomfort. No, the Creme du Ciel cream is not cheap, but it's worth every penny in gold!!! If we could sell it any cheaper we would, but the process to produce the active ingredient Charismon(R) is complicated and costly. The Creme du Ciel Body Lotion is a wonderful daily product to keep your body's skin healthy and youthful, applied morning and night, your senses and your skin will appreciate it. It's also soothing for dry skin, clorinated skin, and sun damaged skin. We suggest applying it immediately after shaving, you will know why . . . The Creme du Ciel Bath & Shower Gel is a must have addition. Not only are the senses awakened when showering or bathing, but the active ingredient has a nourishing, soothing effect on your skin. You will never feel showering or bathing that luxurious again. And just wait, your skin will appreciate it. It's wonderful for daily use, but a heaven-sent for burned skin, infected or diseased skin, and so smooth for shaving everywhere. Evaluation of the effect of Egg-oil on burns. The result: The ointment for burns with egg-oil has reached the golden standard. The egg-oil fastens the healing of wounds 3 – 4 days quicker than the compared ointment and also prevents the spreading of pathologic bacteria. This study has been published as a doctoral thesis. 2. Laboratory Dr. Lörscher, Ludwigsburg. Chemical analyses of toxic agents in egg-oil. Result: all possible toxic agents are much lower than permitted limits. Gaschromatographic analyses and Totalionenchchromatogramme of the egg-oil. Result: absolute free of germs. 5. Proof of antibacterial efficacy of the egg-oil on the worldwide resistant bacteria Esch. coli and Staph. aureus. 6. Exact biochemical analyses of the egg-oil by Biochem, Karlsruhe. Application test of the test preparation oil of egg creme. Result: The treatment with the test preparation shows a significant improvement of the skin surface after a period of 3 weeks. Epicutane testing for skin irritating effects of cosmetics on humans. Result: No irritations caused by La Crème du Ciel. Testing for antiphlogistic effects in a UV-modell of the oil of egg creme. Result: The crème shows anti-inflammatory effects. Study on investigation of therapyrelevant effects of a test-substance (“egg-oil”) on ambulant patients with minor acute dermal inflammations according to functional characteristics of the microcirculation, behavioural patterns of the white blood cells and reflection-spectrometrical patterns in the target-tissue in comparison with a control substance. Result: The examined verum-substance has a functional and metabolic based local efficacy with regard to an improvement of the function of the microcirculation and stimulation of immunologic reactions, reflected in the convincing results of the statistic evaluations of the measurements. Oberservation of application. Study on investigation of local prophylactic, protective and i.a. therapyrelevant effects of a test substance (“egg-oil”) on the gingiva in comparison to a control substance on probands with experimental gingivitis according to functional characteristics of the microcirculation, behavioural patterns of the white blood cells and reflection-spectrometrical patterns. The application of the test substance “egg-oil” on probands with experimental gingivitis has caused a considerable improvement of the functional condition of the gingival microcirculation and, at the same time, stimulated the endogenous immune defense, so that a faster recovery of physiologic conditions in the experimentally inflammed target-tissue was gained. The renunciation of the application of “egg-oil” in the control-group caused a delayed restitutio of several days. The observed time constants and measurements of change of characteristics do testify for a good protective and prophylactic efficacy of “egg-oil” in case of parodontopathies; the changes of the gingival functional conditions of the microcirculation seem to make therapeutic application in the field of periodontology to be successful. ”Egg-oil” supports die microcirculation and the immune defense in case of inflammations. Skin and intestines belong to the immunologic most active organs. Are these organs inflammed, it is very important for the restitution process, what local adjustment range and what functional condition of the microcirculation, that means the blood flow in the smallest blood vessels, is present in the respective tissues. In order that the carrier of the immune defense, the white blood cells, can fully develop their immunologic reactions, it is necessary that they are first of all transported into the network of the smallest blood vessels and spread well pass into the capillary blood streams. If there are optimal streaming conditions, the first steps of the immunologic defense reaction can be started without delay: the adhesion of the white blood cells to the micro-blood-vessel wall and thereafter the passing of the white cells through the wall into the tissue. Then follows the chemotactic location and the phagocytosis, e.g. of a pathogenic organism. The correlation between functional condition of the microcirculation and the immunologic defense options is not only essential in pathogenic processes, but also with regard to the protection and prophylaxis of several inflammatory processes in skin and intestines. The clinical practice knows a line of medical preparations which can stimulate the aforementioned mechanisms, but cause undesirable side-effects. Among the almost immeasurable amount of skin care and similar products – the manufacturers of which claim that their products have protective and prophylactic effects – you will fail to find valid efficacy proof. Particularly in the field of body- and oral care and self-medication, e.g. in case of minor inflammations of the skin and oral mucuous membranes, there is a lack of effective products that can improve the functional condition of the microcirculation and stimulate endogenous defense mechanisms in the sense of a real protection and prophylaxis without causing the user undesirable side-effects. The very good and very interesting results are listed under “Scientific Results" (Button). Local efficacy of “egg-oil” on the microcirculation of hemorrhoids. Examination of the biologic efficacy of the test substance “egg-oil” with the help of reflection-spectrometrical, reflective light microscopical and intravital-microscopical characteristics with regard to the function of the local microcirculation and the quality of the skin surface in comparison with a placebo-substance in case of a biometric sufficient random sample of defined old scars. The very good and very interesting results are listed under “Scientific Results (Button). 15. International Institute for Biophotonic Research, Prof. Dr. Popp. Result: A tincture developed from egg-oil shows higher biophotonic radiation than the egg-oil itself. 16. Municipal Hospital Offenbach, Prof. Dr. Kitschke. Scientific study of egg-oil ointment in the treatment of scars healing after breast-cancer surgery. Intermediate result: It shows clearly very good effects. 17. University Dental Clinic Aachen, Microbiology, University Prov. Doz. Dr. G. Conrads. The egg-oil shows a statistically significant minimizing influence on Prevotella intermedia at gingivitis and superficial parodontitis. Under the tested criteria, there is no evaluation of Charismon® as a toxic or harmful substance. 20. Institute for experimental dermatology, University of Witten-Herdecke, Prof. Dr. Tronnier. Skin’s roughness was decreased by 33 %. Skin’s scaliness was decreased by 54 %. Skin’s smoothness was increased by 18 %. A positive influence on wrinkles is usually achieved by cosmetic means only to a very small extent. Nevertheless, the wrinkles were minimized on an average of 6.3 %. All results are clearly significant. 21. Institute for Microcirculation, Berlin, Dr. med. Rainer Klopp. 22. Institute for Biophotonic Research, Neuss, Prof. Dr. A. Popp. Influence of the egg-oil and a preparation made from egg-oil on the skin with biophotonic measurements. 23. Institute for kinematic cell biology, Frankfurt/Main, Prof. Dr. Bereiter-Hahn.